If you are not using Facebook retargeting ads then you are losing business. Ads retargeting is an important subject in marketing but many businesses are not aware of how to take full advantage with ads retargeting. In this post, I’m going to teach you a step by step process on how to set up facebook retargeting ads. Using Facebook retargeting campaign, you will be able to convert more visitors into customer. Every small business can boost its sales to a whole new level. It is a great way to promote your business online. In the marketing world, retargeting is an online advertising form which can help you connect with website visitors which left without taking the desired action. Retargeting is also sometimes known as remarketing. There are a couple of different retargeting programs you can use such as Facebook Pixel, Google Adwords Retargeting, AdRoll, Perfect Audience, etc.. 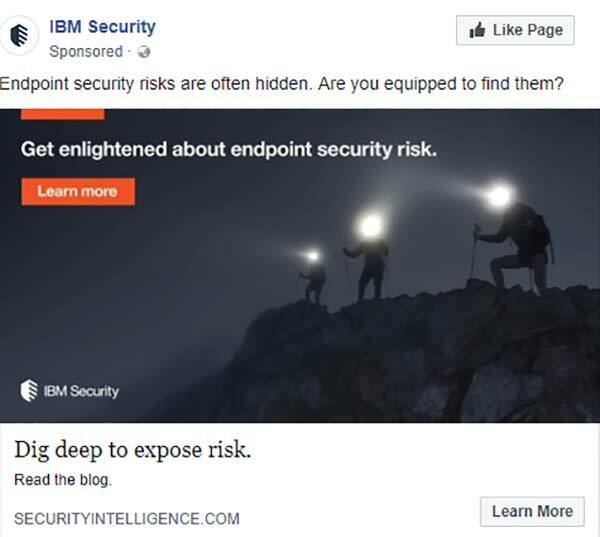 In this post, we are going to only talk about Facebook retargeting ads. Have you ever checked a product or visit a website and later on when you are surfing Facebook newsfeed, find advertising from the same website? Well, this sort of marketing is done with the help of facebook retarget advertising. It has great potential as an advertising platform. Any website visit can be converted into a customer using retargeting ads. Do you use Amazon to sell your products? If yes then check out this Amazon SEO guide to boost your sales. Just imagine that your customers get distracted when they were about to check out. What if they see your products on their newsfeed? Most likely, they will remember and complete their purchase. Similarly, your customers might be reluctant to purchase from you because they are not sure about the value you are offering. For such customers, a 20% discount offer can work, and you can pave the way for a good relationship between you two. Some people think that retargeting sounds invasive, but this is not the case. In fact, a nicely set up retargeting campaign shows that you pay attention to your customers and take care of their buying experience. With the help of a content retargeting ad, you push your audience to an article that may help them. Your end goal for such an ad is just to make awareness instead of pushing your audience to make a purchase or even to sign up. In most cases, these types of ads help you build an email list. You can link such ads directly to a free download or a landing page. The main purpose of retargeting ads for lead generation is to offer some value to your audience or help them in solving any of their problems. Later you have a chance to convert them via email. The main purpose of direct purchase retargeting ads is to bring people back to your product purchasing page. Usually, these ads are used for people with whom you already have a good relationship. For instance, people on your mailing list. One of the best practices for such ads is to offer a special discount on the product to your customers. 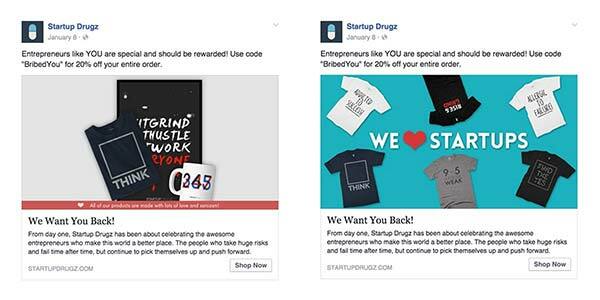 How to Set up a Facebook Retargeting Ad Campaign? Now, let’s discuss how you can set up a successful Facebook retargeting campaign step by step. The first step towards running a successful Facebook retargeting ad is to install Facebook Pixel. Last year, Facebook has updated its old tracking system to a new one. Therefore, make sure that you have installed the latest Facebook Pixel. Pixels help you in tracking the behavior of your customers, like where they go, what they do. This tracking helps you to retarget them properly. To Set up your retargeting pixel, go to Menu > Pixels. If you are creating pixel for the first time, before hitting next, name your pixel. After naming your pixel, you need to choose the way you are going to install it. 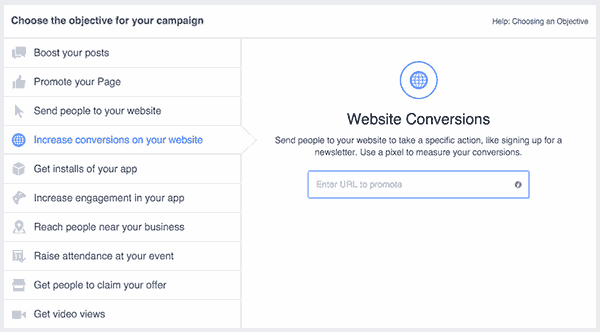 Currently, Facebook gives you an option to integrate your pixel with WooCommerce, Google Tag Manager, BigCommerce, Magento, and Wix. If you are using any of these platforms, you only need to select yours and follow instructions. If you are not using any of the above platforms, don’t worry. You can still install pixels on any site. You just need to copy and paste the code in between the HTML < head > tag on your website. Usually, all platforms offer simple instructions that you can follow to edit this part. 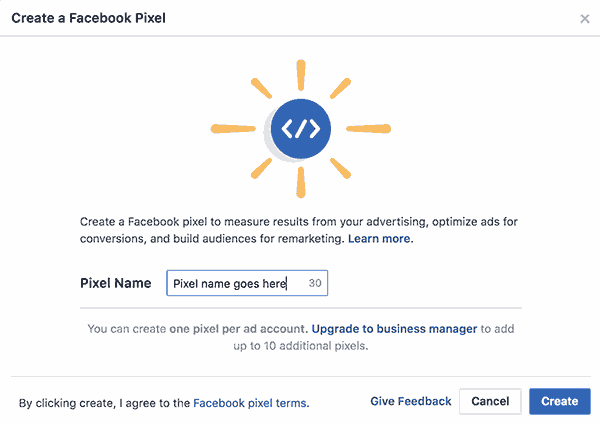 You can also use Facebook pixels to track all the actions your customers take on your site, such as, adding a product to the cart, filling the billing information, etc. But to do this, you need to add a few extra code lines on specific pages. The common pages that you may need to track are the ‘Thank you’ and ‘Checkout’ pages. To make sure that you have installed everything correctly on your site, download this Facebook Pixel Helper plugin for chrome. 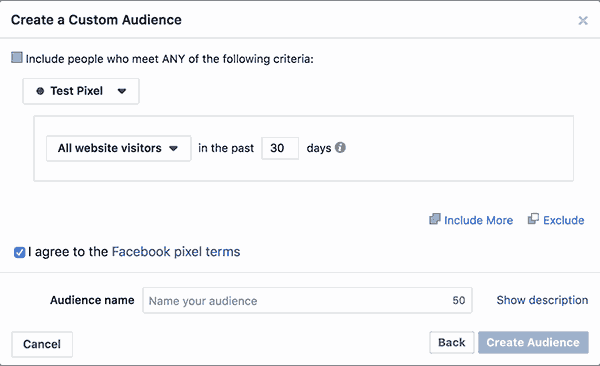 After installing Facebook pixels, go to Facebook Ad Manager and start creating a custom audience that you want to retarget. To do this, go to Menu > Audience > Create Audience > Custom Audience. This will allow you to retarget people based on their behavior on specific pages of your website. Your target audience depends on your retargeting campaign goal. For this guide, I will assume that our campaign is meant for abandoned carts. Period of showing the retargeting ad is also an important parameter. For abandoned carts, you can show this ad for 10-14 days. After 14 days, if still, your customers don’t want to buy your product, you are doing nothing but annoying them. After setting up the filter, now you need to name the group and save it. If you are a new user of the Facebook pixel, you may see a warning that says, Audience too small. It is because, according to the requirements of Facebook, you should have at least 20 customers who fall in your criteria, before the campaign starts. You can continue setting up your campaign. It will turn on as soon as the required number of customers are tracked on your site. After setting up your audience, now it’s time to run some specific ads to retarget them. An effective way to retarget your audience is to create ads which are based on specific categories or products. If your website contains many products, you can create ads for the best sellers. Try to add your logo and brand name to your ad copy, as you will get tons of impressions, even if your target audience decides not to buy from you. Once you are ready, click on “Create Ad” on the top right of the screen. The next step is to determine your objective of creating an ad. Facebook gives you some options to choose from. The most common options are “Conversions” and “Traffic”. 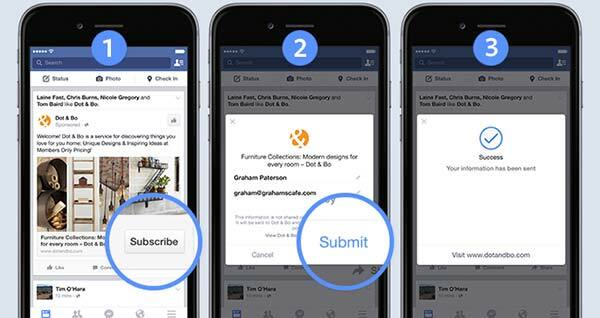 Determining your objective helps Facebook decide to whom they should show your ad based on their prediction on who can help you in achieving your objective. If you are selling high-ticket products, you better stick to the traffic goal. It is because, before purchasing an expensive product, people usually visit your website many times. To start a new campaign, you need to name it, and click on continue. After that, you must select your goal, which in this case will be Conversions. Verify your pixels. Usually, the main purpose of selecting conversions as your goal is to let the customers purchase. Therefore, select that option. If you need to learn more about it, Just click on Learn More, and you can learn from the guidelines of Facebook towards your goals and funnels. Under the option of the custom audience, select the group that you have saved for retargeting in Step 2. Once you are done with creating, designing, and targeting your ad, the next is to determine where it will show. To be honest, the best way to do placement is to let Facebook do it for you. No one knows better than Facebook that where your ad can perform the best. To see the results of your Facebook ad campaign, you don’t need to spend a lot of money at first. Obviously, it depends on your business as well, but it is better to start with a small budget and then raise it for the campaigns that are proved to be profitable. Retargeting ads should run continuously, as new people will keep visiting your site, and abandoning their carts every day. It is also important to keep an eye on the efficiency of your ad. If an ad is not working efficiently, stop it right away. From here, you can create an ad as usual. Using good images and action-inducing triggers help you create compelling ads that can convert well. 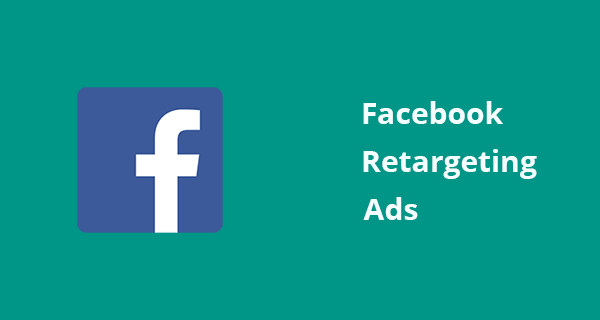 How to Formulate a Facebook Ad Retargeting Strategy? Well, there are a lot of ways you can use retargeting campaigns. However, these are some of my favorites which helped some of my clients getting higher ROI. Before you start throwing ads to anyone your website visits, you should remember that sales don’t work like that. Yeah, sometimes people buy things on the 1st engagement, but most of the times it doesn’t work like that. So, you need to build an audience which is most likely to buy at this point. For example, people who didn’t check out but added products in the cart. You can set up this audience and retarget them with ads. Or if you are selling a digital product/service you can set up a lead magnet campaign. If you get lots of traffic on your service/product pages and people are not converting well then you can use this strategy. Let’s suppose if you are selling an expensive service and people are not contacting you then you can retarget this audience with compelling ads. You can show them a video where you introduce yourself as an expert and answer specific questions to your service. Similarly, you can get their email with an enticing lead magnet. Facebook retargeting is a great way to boost your conversions and sales. By using an effective retargeting strategy, you can improve the ROI of your business. I hope you find this post useful. If you did, then also check out how to add facebook chat in a WordPress website.